When children's author Kathy Brodsky came to me with an outdated, difficult to navigate site I was thrilled to help this woman (100% true statement, folks). 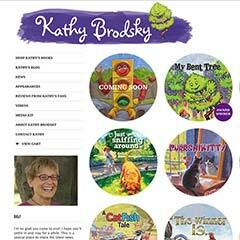 Being able to play on the whimisical nature of her books I gave her fantastic books the mobile-friendly website they deserve; and Kathy can now update her own content. Be sure to check back often as this site is sure to evolve over time.